Above is this year’s E3 press badge. 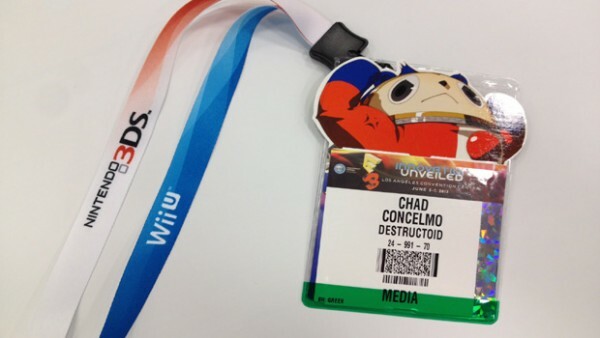 As you can see, it features Nintendo-themed lanyards advertising the Wii U and Nintendo 3DS. Even the character Teddy from Persona is there. I wonder how much money Nintendo paid to get this exclusive ad space. At any rate, it’s a humorous thought that every single E3 attendant this year is carrying the Nintendo love. I thought I was first!! Last year they did the same thing with the Zelda 25th Anniversary/Skyward Sword lanyards. And I was lucky enough to be in attendance to get one! Nintendo sure serious this time. Good, I wanna a big surprised from E3. there all supporting nintendo because nintendo is the N U M B E R O N E!!!!!!! !